SOUNDSATION – Feel the sound ITALY MEANS CREATIVITY, INNOVATION, VITALITY.ITALY MEANS STYLE In the globalization era, Soundsation proudly claims its origins, with eyes set on the horizon but heart beating in its enchanting homeland. 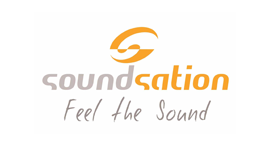 Born in 2005, Soundsation is today a reliable brand for a growing number of musicians and music lovers, an Italian team where new ideas, new projects and enthusiasm join together, day after day. Step inside Soundsation’s world, and get ready to Feel the sound.